“I heard about it long before I went to Dartmouth — it was kind of legendary,” he said. Similarly, John Ryan ’90 remembered the wonder surrounding Carnival weekend inspired by looking at the Winter Carnival posters his father, a member of the Class of 1958, hung around his childhood home. “Winter Carnival was terrific fun in the early 70’s when I always attended,” wrote Doriane Ruml ’75 in an email. Many alumni fondly remembered the ice and snow sculptures built in the center of the Green. “Its cliché, but I think the statue on the Green is pretty remarkable,” Ryan said. Stephanie Gardner ’10 agreed, adding that the snow sculpture was her favorite Winter Carnival tradition. “It was a lot of fun. The whole student body participated,” said Peter Frederick ’65, who recalled the days when ice sculptures would be built on the lawns of fraternity houses, each working hard to out-build their neighbor. Frederick remembered one particular moment during the construction of a snow sculpture. An older-looking man who had started helping pass snow up the ladders on the statue was moving fairly slow, prompting the other builders to shout at him to speed up. When the older man looked up, they realized it was College president John Sloan Dickey. “Literally everyone on campus was involved in building the statues,” Frederick said. Alice Dragoon ’86 served on the Winter Carnival council during her first year and remembered spending “a lot of time out on the Green” helping to build that year’s “enormous statue of Pegasus,” she wrote in an email. She also recalled other council members working long into the night to ensure the sculpture was ready by Carnival weekend. Gardner remembered one year when the statues builders ambitiously hoped to make a replica of the Moosilauke Ravine Lodge, large enough for people to walk inside, but the warm weather reduced it to the “saddest pile of snow,”which they decided to call Mount Moosilauke. Another memory cited by many alumni was the luge tracks built from the roofs of fraternity houses. In addition to the weekend’s iconic events, Winter Carnival has long been associated with parties on freezing New Hampshire nights. “Especially during Carnival, days were dedicated to outdoor sports and nights were dedicated to bands and partying,” Ruml wrote. Winter Carnival and Dartmouth weekends in general brought “unusually good dancing opportunities,” she added. However, the weekend has not always been associated with high spirits for all members of the community. “Initially I had looked ahead to Winter Carnival with a good deal of trepidation,” said Lois Gadway Tow ’76, a member of the first class of women to matriculate at Dartmouth. “Coeducation was not 100 percent welcome by the men on campus,” Tow said. “There was negativity and I remember thinking that [Winter Carnival] does not sound like it is going to be any fun at all. It could be pretty miserable. I might just go home for that weekend,” she said. Tow said that a “huge cultural change was happening at Winter Carnival” during her first winter on campus. Dates traditionally played a central role in the Carnival festivities. Before and during the early years of coeducation, Dartmouth men used to “import women from the Seven Sisters and wherever else and they would come by bus” as dates for the weekend, Tow said. Frederick echoed this, remembering the arrival of dates as one of the main tenants of Winter Carnival. “Most of the dates came from off campus,” Frederick said. Tow remembered a rumor circulating campus before Winter Carnival that the female Dartmouth students would not have dates for the weekend. She felt as though Dartmouth men were not interested in dating Dartmouth women. Tow recalled a male classmate saying something to the effect that he did not want to sit across the table in the dining hall from someone he had spent the weekend with. “Of course, the answer to that was: What are you planning to do on the weekend that you would be feeling that way, ashamed to sit across from somebody?” Tow said. The rumors turned out to be just that, and Tow did end up having a date, a member of the class of 1974 who is now her husband. Tow also recalled entering the dining hall for a dinner held every Winter Carnival when she and her date were stopped and told the dining room was for Dartmouth men and their dates. “We said, ‘We are dates,’ and he let us in,” Tow said. Tow remembered that by her senior year, the culture shock of female students at Winter Carnival was “getting a little calmer,” given that the male students at Dartmouth had all come to the college expecting it to be co-ed, she said. The Winter Carnival tradition has changed vastly over time, with traditions coming and going. “It’s much safer now then it was then,” said Frederick in reference to elements of the sculpture building and other traditions that have been removed over time due to their dangerous elements. 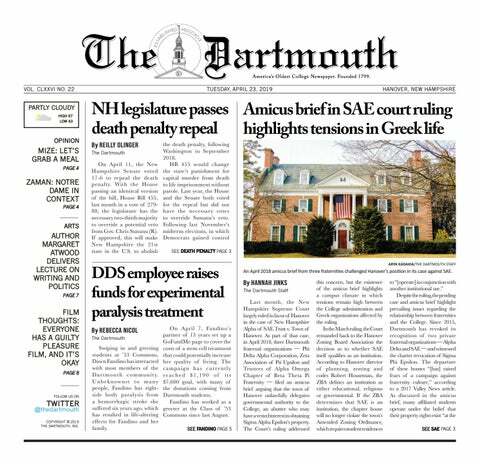 However, the one constant throughout the last century has been the prominent place of the weekend as a defining moment of the Dartmouth student and broader community’s winter.